Hey friends! I had planned to take today to talk a bit about changes to the format as a result of the patch and the new promos and such, but I already gave a run-down on my Podcast which covers most of what I wanted to say about that. There isn’t nearly enough to say to fill up an article as well. Instead, I am taking the time to revisit a subject I have written about before: balance. The topic of Sandstrom Titan being overpowered has come up a lot in Discord, on Reddit, and even on the old Eternal forums. Today I wanted to touch a little on some questions about balancing, and the various challenges Titan is trying to solve. Part of the objective of this is explaining why cards that may seem extremely powerful (like Sandstorm Titan) may not need to be changed, while ones that are much less powerful (like Excavate) could be nerfed. A “pushed” card is a card that has deliberately been made to be good, and has a higher power level than the average on purpose. One practical reason for pushed cards is so people have cool flashy cards to be attracted to. New sets won’t sell if there is nothing interesting in them. Pushed cards acts as signposts, allowing players to navigate a large confusing card pool. A good example of this are cards like Torch and Oni Ronin leading aggro players to Fire. Having pushed cards allow games to feel different. If all cards were roughly the same power level it would mean games would tend to feel the same. You would have fewer moments where you need to find a way to beat your opponent’s A+ card with your B- cards. Designers want to push players towards fun and interesting play patterns. If designers push people towards playing cards that are fun the game will be fun, as opposed to play patterns that are uninteractive, degenerate or repetitive. Pushed answer cards mean no one strategy can get out of hand. Games become more skill intensive when cards have varying power level since you need to find innovative ways to use suboptimal tools. The other thing I want to repeat is the same disclaimer I gave at the start of the last article: nothing that I am saying has been endorsed by Dire Wolf Digital. Although I have probably had more direct conversations with DWD employees than the average player, they have not given me special information on these subjects. I would classify myself as a “game design enthusiast”, and have consumed tons of content on the subject, but I do not have any formal training. Sandstorm Titan is arguably the most powerful card in the entire game. It is, pound-for-pound, the biggest unit in the game, and comes with 2 fantastic abilities. I don’t have to list these things off to you. Everyone knows what Titan does, given that you are likely to run into him pretty quickly as you move up the ladder. Every patch that hits has a round of people talking about how XYZ pet card was changed, while Darude is able to stick around. For example, why nerf Excavate when Darude is still around? Isn’t Excavate like 10% as powerful as Titan, and sees like 1% as much play? Shouldn’t DWD be trying to nerf cards that are obviously way more powerful? 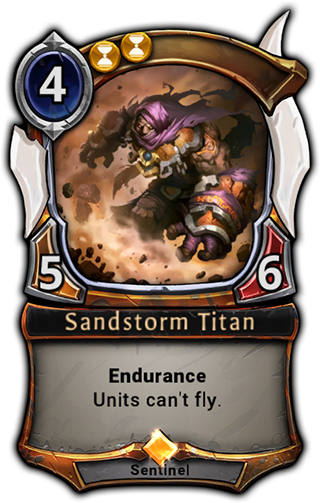 I strongly believe Sandstorm Titan is not only totally fine, he is also essential to the balance of the game, and almost any balance change would have a massive impact on metagame health. I am going to defend this here as best I can. I’m sure there will be some people who I have not persuaded, and I encourage them to share their thoughts on the subject in the comments section or on Reddit. I know this is a contentious issue, so please be constructive in their tone. Lets come up with a list of reasons that a card should be nerfed. In coming up with this list, I have gone through the Banned/Restricted list in Magic the Gathering as well as the list of patch changes in Hearthstone to find the most common threads for something being banned/changed. There are some important differences between digital and paper games of course. It is impossible to “nerf” or “buff” a paper card once it is printed. The test for Magic the Gathering bannings has generally been “This card is so problematic that the health of the format and the game is in jeopardy if we keep it around.” The metric for digital card games has been closer to “The game would be improved if this card is changed.” Here is the list of reasons for balance changes I was able to come up with. Many cards that seem fair by themselves become totally mental once combined with other effects. This is most pronounced in Magic the Gathering, where a large card pool can lead to bizarre combos coming about. Take for example the following card. In Eternal this could be translated to read “2X Spell, you can play up to 3 additional power this turn.” So it just seems like a middling ramp spell? It synergizes with stuff like empower, but so what? Well, this card was part of a totally degenerate deck that was able to attack for lethal with multiple 6/6 double damage overwhelm units by turn 3. Huh? What? How does that happen? Well, the short answer is big card pools can lead to strange interactions that can end up being totally broken. Not only was this combo off the charts powerful it was also difficult to interact with. There were some decks that could break up the synergies, but it was very hard. In Eternal’s History we actually have an example of this: Party Hour. This was a deck that powered out The Witching Hour as fast as possible, usually in combination with Champion of Cunning (in it’s previous form it gave +2/+2 flying and charge to your team) to allow for a one-turn-kill. I personally would not argue that this deck was over the line in terms of power level, since the metagame (especially at the top) had adjusted to it. The main score against this deck was how hard it was to interact with, leading to frustration for novice-to-mid level players, and this is why it was nerfed into oblivion. Some combo decks are powerful, but other decks are more obnoxious. The power level of these deck doesn’t matter as much as having a deck that kills through difficult to execute loops that take an absurd amount of time. There was a deck in Magic’s Modern format that fit this description very cleanly: Eggs. Here is a link to a video of Stanislav Cifka winning with the deck at Pro Tour Return to Ravnica (for any Hearthstone players out there Stanislav Cifka = StanCifka). Although he slowed down in the high stakes finals match, Stan’s operations were lightning fast in the Swiss, and his combo still takes forever. Once he won the Pro Tour a bunch of amateurs picked up the deck, and suddenly Modern tournaments would grind to a halt from players taking forever to actually play out their games. Once again, there is an analog in Eternal: Excavate. It is fairly difficult to argue that the power level of the Excavate decks was so high it warranted a nerf, but holy moly is their play pattern miserable. Obviously an experienced player will know that they usually can’t beat this type of combo and will just concede, but anyone who doesn’t understand what is happening will have a miserable time. Was Excavate in its previous form too powerful? Probably not. Does it have some problems with upcoming cards? Possibly. Does it promote unfun play patterns? Definitely. This is the criterion most people understand for changing cards. It is simple: the card is just too good. You can point to many cards in other games that fall under this category (Skullclamp and Treasure Cruise in Legacy and Modern, moving Auctioneer and Leeroy Jenkins to 6 mana in Hearthstone, etc.). There are tons of high profile nerfs from Eternal that fall under this category, most notably the series of Rakano nerfs going back to early closed beta. These cards lead to decks that were just too good at killing too fast for the format to be healthy. Why am I going off about all of this big picture junk? Why am I talking about balance of combo decks while the subject of the article is all about a card that is pretty much nothing but a big pile of stats? Well, I think these different types of balance problems have different criteria. For example, take a card that is part of a powerful combo. How consistent is the combo? How quickly can someone “go off”? Are there many ways to interact with the combo? A deck like Vodacombo in Eternal certainly has a very powerful combo when it goes off, but it happens so infrequently that the deck is not even approaching a problem. For the “unfun” category I think a designer’s focus would actually be on the new player experience more than anything. I imagine designers are fine if high level masters players occasionally locking one-another out of the game, but that is very different than someone who is new to the game facing something like the Echoscavate lock. As a new player it is very confusing, very unpleasant, and takes a very long time. Although the impact on other levels of play are going to be relevant in their decision, I imagine the impact on the new player is most important, as this relates to the long-term health of the game. Finally we can talk about the reasons for rebalancing cards on the basis of raw power. What are the questions the developers must consider for balancing these cards? I have been able to come up with three that seem to be the most relevant. Does this card have an overly warping effect on the metagame? Are there inadequate answers/counter-play for this card? How does this card fit into the overall scheme of balancing the game? To say that Sandstorm Titan is too good we would need to show it is having an overly warping effect on the metagame. What do I mean by “warping the metagame”? Well, the clearest example of a warped metagame I can point to would be during the time of Affinity in Magic the Gathering. Affinity was a beatdown deck that used artifact synergies. The format consisted of basically two decks: Affinity, and decks packed with artifact destruction spells. That is a very warped metagame. No diversity, and everything revolves around one deck type. Obviously the Affinity era was an extreme, but this gives us a picture of what “warped” looks like. If our metagame allows for a range of strategies and deck types it is healthy, while a meta focused all around Sandstorm Titan decks would be warped. So lets take a look at the health of our meta! I’ve taken the last tier list and organized the decks from the top 3 decks into Sandstorm Titan and Non-Sandstorm Titan decks. We have a roughly even split. It should be noted that there is a bit of a bias where more Titan decks are lower in the tier ranking, but lets not worry about that. The important thing is that there are lot of Titan and Non-Titan strategies that are available to play. But wait! Maybe we are looking at the wrong thing. Maybe we should be looking at metagame health from the perspective of the balance between different strategy types. Maybe things are skewed in some other way? Lets divide the strategies into aggro vs. midrange vs. control? Hmm, looks pretty balanced to me. Ok then, lets take a look at the balance of factions. Maybe time is overrepresented? Seriously. That is insanely close. I didn’t even know this was the numbers before I started, but clearly the format is balanced enough where a wide range of strategies are viable. It is hard to make an argument that a given card is warping the metagame when the metagame looks very healthy. Ok, so let’s look at the next criteria. Titan is clearly great, but how good are the best answers to titan? Do we need to contort our deckbuilding to deal with him? Are there multiple factions that are unable to answer a Titan? Lets take a look. Below I have compiled a list of the 3 best removal spells in each faction, as well as what I believe to be the best 3 multifaction removal spells. Beside each I have listed whether or not it kills Titan. So, lets summarize this. 12/18 of the most common removal spells kills Titan. Seems like a good number to me. But, let try and be fair. No one is excited to Flame Blast a Titan, even though it obviously needs to be done on occasion. Lets change the criteria to be stricter. How many trade with even-or-better resources? No sacrificing, no overpaying or anything. This shortens the list to 5/18. That doesn’t seem as good. Does that concern me? No, not really. I don’t see any reason why it is a problem that some select threats are a bit harder to remove than others. I am also using fairly strict criteria, and if you soften the restrictions slightly to include Obliterate you will see that 4/5 factions have removal spells that answer Titan in an efficient manner, with Primal being the only one without an effective answer. Primal obviously feels this restriction, and most Primal decks need to play a second faction to have access to efficient removal spells for Titan. I don’t see this as some major gap in balancing though. So, from what I am seeing, if you want to kill Sandstorm Titan you can. Almost every faction has a functional answer, and all 2-faction pairs have at least one efficient answer. Obviously he will kill you pretty quickly if you don’t remove him, but that goes with almost any playable 4-drop. In my opinion there are more than enough ways to kill him to go around, and it isn’t like you are playing some horrible cost by putting cards like Annihilate or Vanquish in your deck. Ok, so we have established so far that the metagame is not warped around Sandstorm Titan, and that there are plenty of ways to kill him if you want. For my last section, lets talk about the role Titan plays in the overall balance of the format. I feel as if there are some fundamental misunderstandings about balance. A format’s health is not just about the power-level of each individual card taken in the abstract, where one card being above the average causes everything else to break down. Rather, one needs to think about formats as a complex web of interactions. I find this helpful both for understanding balance, and deck selection. “A” interacts well with “B”, so if I am playing a deck with “A” I should try and play “B” as well. At the same time, if “A” is popular I should avoid playing “C” since “C” is weak to “A”. Instead I should play “D”, which has a good matchup against “A”. It is fine if “D” has a bad matchup against “C” since “C” should be unpopular when “A” is popular. This may sound like rock-paper-scissors, but understanding metagames is way more complicated than this (this may be a topic of a future article if there is interest). By analyzing this web of interactions, you can better understand the position a given card plays in the balance of an entire format. To begin with, flying in Eternal is super powerful. There are very few cards that specifically hate on flyers, and several factions are short on good flying units. Fire has exactly 1 unit with flying that sees ranked playable (Soulfire Drake). Time has Scorpion Wasp, but that doesn’t really count. Justice has more than most, with Valkarie Enforcer and Silverwing Familiar, though only one of these units is actually efficient all by itself. Primal has no shortage of great flyers in draft, but actually has none good enough to see considerable ranked. Shadow, on the other hand, has 2 outstanding Flyers: Impending Doom and Umbren Reaper. When we go to multifaction there are a few more powerful flyers, but most of them have very steep influence requirements (e.g. Champion of Wisdom, Champion of Cunning and Icaria). So, to summarize, there is only a small handful of flyers, and most of them are extremely powerful. If Sandstorm Titan did not exist, or did not have the anti-flying ability these flyers would be running over people left and right. Flying would be too good, and only a limited number of decks could really interact with flyers in combat. Sandstorm Titan keeps flying at a manageable level, and it is interesting to note that many competitive level flyers has exactly 5 attack. Weird right? It is almost like Dire Wolf wanted them to struggle battling Titan’s 6 health. Next, lets talk about Darude’s second ability – endurance. Endurance is a cute little ability that makes Titan great at playing both offence and defence, as well as being resistant to Stun effects. There are two stun effects that have regularly seen Ranked play – Permafrost and Eye of Winter. Taken in a vacuum, I actually think both of these cards are extremely powerful. Permafrost is a 1-power removal spell, and can “kill” a unit of any size. That is unbelievable! 1-power kill anything? What’s the catch? Well, there are several catches as we all know, but Permafrost’s inability to hit Titan is one of the most important. I personally think that if Titan did not have endurance Permafrost would be overpowered. The card is extremely powerful as-is, despite missing one of the most common units in the game. The other stun effect that we have seen have success in ranked is Eye of Winter. It should be noted that this card is (in my opinion) inches away from being toxic for the environment in the same Excavate was. It basically locks out unit-based midrange strategies when paired with sweeper effects like Harsh Rule. If you have not played against TPJ control lists or Icaria Blue lists with Eye of Winter you may not really know what I am talking about, but the game can often get to a state where you are just locked in this miserable bind where you either get 2 or 3-for-1’d off a sweeper, or just let your opponent draw cards while you do nothing. This play-pattern would be a huge issue if Eye of Winter didn’t have several systematic weaknesses, the most important of which being a massive vulnerability to Sandstorm Titan. I am fairly certain that Titan losing endurance would lead to a control dominated meta that would be much less interesting than the one we have now. So, we have established that Titan needs to keep it’s anti-flyers clause, and its endurance, but what about its stats-to-cost ratio? Isn’t that the real problem? Well, I actually don’t think they can be changed. First off, there are all these 5-attack flyers we talked about earlier (Drake, Reaper, Doom) which Dire Wolf seems to have designed specifically to be bad against Sandstorm Titan, so Titan needs to keep 6 health in order to be able to brawl with all these cards. What about his strength? Can’t we change him to a 4/6? Again, probably not. A 4/6 would no longer be able to trigger all the “5 strength matters” stuff, like Dawnwalker or Friendly Wisp. There are no other 5 strength units in mono-time at 4, and only 2 at 4-power or less if you count multi-faction. In order for 5-strength matters to be a thing there is probably going to need to be something at the 4-cost slot to fit this role. In addition to all of this, the cost of 4 seems pretty important. Titan already is at a -2 power exchange against Annihilate and Vanquish, and being at a -3 deficit would be much worse. Titan would also come down too late to be relevant in many important match ups, as many beatdown decks could easily kill before turn 5. I think one of the main objectives of Sandstorm Titan’s design is to keep Rakano in check, as they must either play Vanquish which dilutes their aggressive beatdown plan, or they must find some backwards way to chew through the giant 5/6 body. If Titan were moved to 5 cost I think Rakano would become way too good, as giving them an extra turn to develop before needing to deal with Darude would be a major boost. Okay, to finish up I want to summarize my arguments as to why Sandstorm Titan needs to stay the way he is. 1) The metagame seems to be relatively healthy. If Sandstorm Titan were warping the metagame we would see it in overrepresentation of certain types of strategies. At present it seems the balance of various strategies is balanced by any available metric, so it appears as if Titan is not overly warping the metagame. 2) Most of the common removal spells hit Sandstorm Titan, and a number of them hit him in an efficient manner. Almost every faction has access to efficient Titan removal. It also does not appear that players need to skew their removal suite just to answer Darude, as most removal that interacts favorably with him is generally good. 3) Few factions have access to premium flyers, and the flyers that are around are often extremely powerful. The anti-flying clause on Sandstorm Titan is essentially for keeping flying units in check. He is an important part of balancing flyers in Eternal. 4) There are two stun effects in the game that are pushed enough for ranked play. Titan is a powerful endurance unit that keeps these stun effects from being overpowered. 5) Titan’s exact set of stats and cost fit a range of requirements. His 5 strength lets him trigger “5 strength matters” effects. His 6 health allows him to brawl effectively with 5 strength attackers, such as some of the format staple flyers. 4 cost is also essential for allowing him to be a 5 strength unit on-curve, as well as adequately combatting aggro decks or trading with premium removal at a loss that is not totally crushing. Given all of this, I feel very strongly that Sandstorm Titan can’t change. In some respects I almost feel as if the designers put too much weight on Titan, as he fills too many roles. He is doing a ton of heavy lifting in balancing the format, and it feels as if some of that burden would be better distributed between multiple cards. I imagine it would make balancing easier. That being said, putting it all on one card means you can ensure that one card sees a lot of play, which means you can achieve all your goals. Even with all of this analysis, I’m sure there are people who still disagree with me. Is there some argument that I missed? Is there a hole in my logic? Let me know in the comments/Reddit thread! Balance is a complex topic that I have been learning a ton about while thinking about Eternal, and I hope this article has helped make some of my thinking clear. With that, I will bid you all ado! PS: Some people have raised an argument in the past about how Titan being an auto 4-of in every Time deck is a problem. I haven’t really addressed this argument because I don’t understand it. Torch is a 4-of in a lot of decks, why isn’t that a problem? Why is it a crime that Time decks generally play Titan? Are people trying to argue that all Time decks are the same? I don’t think that is remotely true. Even looking at Combrei Aggro and Big Combrei we see major differences in play style. I have never heard this argument used before in other games either. Every red deck in Modern plays Lightning Bolt. Every Mage deck in Hearthstone plays Fireball. Is that a bad thing? I have never heard anyone argue that it is. Someone needs to articulate this argument such that I get why it matters for balance before I address it. Edit: A number of people on Reddit have brought up Titan being a legend as a problem. I felt I should address this here as it is a common point. First, rarity is pretty disconnected to balance in the big picture. As a top level Master player I doubt Titan being a common or a legend would make any difference in how much I saw him. In reality, I know not everyone plays against nothing but top tier players with optimized decks. If you have an issue with Titan being a legend you actually have more of an issue with the reward system/cost of the game rather than the power level of Titan. If you want to learn more about Eternal’s reward system and how it stacks up against other games read my article from last week. For the record, I have said in the past that Titan could be changed to a rare pretty comfortably.